I know some pretty amazing people. I really do. One of such people is a friend of mine from high school. Awhile back, she contacted me and said that Tastefully Simple was releasing some gluten-free products that she would love for me to try. My friend, Rebecca Fifield, just happens to be a Tastefully Simple Consultant. So, she sent them to my. And then Tastefully Simple released more products…and I bought them and some of the ones that had originally just been sent to me. And I loved every one of them that had tried. I think what I love most about what Tastefully Simple is doing with their gluten-free mixes is that they are making it so easy to make bread or pizza or cake cookies or pancakes. They take all that fancy flour mixing and make it so you have it in one easy place, and only need to add 2 ingredients to it. I love it. LOVE it. And now, thanks to both Rebecca and my own trial-by-fire with the gluten-free products that Tastefully Simple offers (they’ve added cookies and pancakes since I last looked! )…I’m obsessed. Because, as much as I love baking and cooking and being in my teeny-tiny kitchen…I love simplicity too. Because baking can be stressful…gluten-free baking can be catastrophic if anything is off. That’s the glory of Tastefully Simple. They take that guess work off. So, with me heading out of town on Friday evening, the main goal this week is to use up all the fresh produce that would otherwise go bad in my absence. So, with fresh basil and some tomatoes and onions lurking about, I remembered that I had a Tastefully Simple Gluten Free Pizza Crust & Sauce Mix in my pantry. So…pizza it would be. AND…it would last for three days between my roommate and I. Added bonus. No more cooking the rest of the week. YAY! 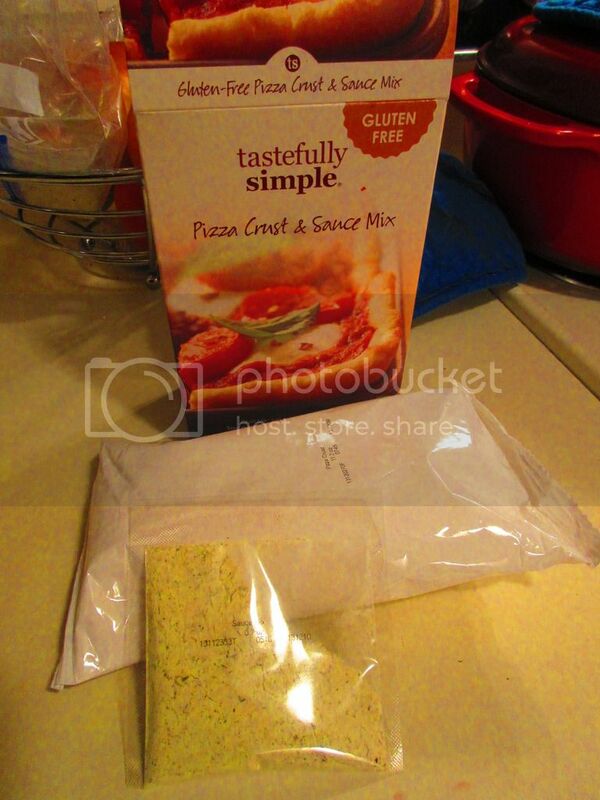 Preparing the Tastefully Simple Gluten Free Pizza Crust & Sauce Mix is super easy!! For real. That’s why there is the word “simple” in the brand. HA! To prepare the crust, simply combine the crust mix with 1 cup of water and 2 tablespoons of olive oil. The dough will be sticky. Cover it losely with plastic wrap and let it stand for 10 minutes at room temperature. Using lightly oiled hands to prevent sticking, spread the dough out on a pizza stone or a 12-inch greased pizza pan. Bake it for 10 minutes in a 400°F oven. While it’s baking…mix up the sauce. It’s a breeze. Simply combine the sauce mix with the remaining 1 tablespoon of olive oil and tomato sauce. Spread it over the warm crust you have now baked for 10 minutes. Add your favorite toppings (in my case…tomato, onion, basil and Daiya vegan mozzarella cheese shreds) and place back in the oven to cook for another 17-20 minutes, until the crust is golden brown. Slice into 6 pieces and devour. The quality, however, always comes in the taste test. And they totally nailed it. The dough wasn’t too sticky when I went to press it out on the pizza stone. And, it cooked up to this amazing crispy, golden brown. The sauce and toppings didn’t make it soggy. It held up to slicing and being moved onto plates. And I loved the flavor. It had this amazing crusty quality that just made it work. It was the perfect base for my toppings of choice. And it was one of my favorite crusts I have made at home. It was easy, and it didn’t take too long to bake up either. Perfect way to enjoy my dinner tonight. 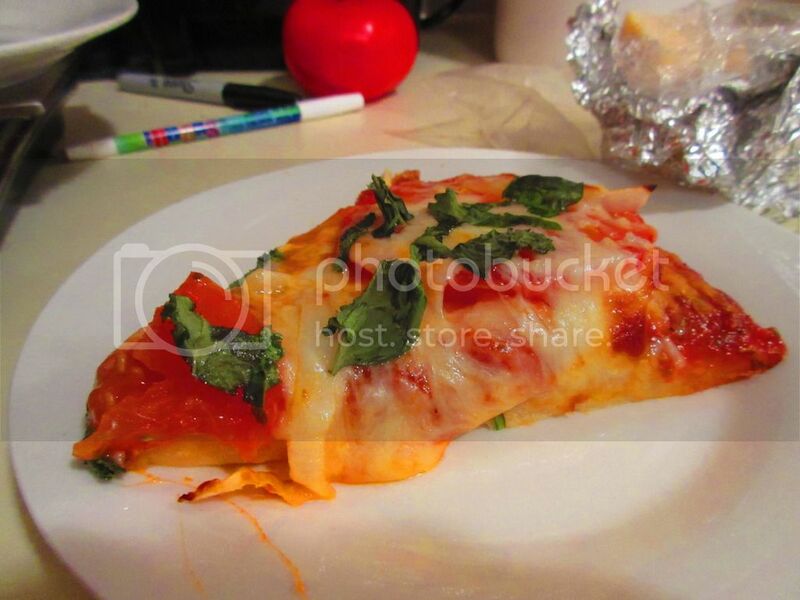 Tastefully Simple is not only making gluten-free delicious, but easy too! So, let’s take a look at what Tastefully Simple puts into their Gluten Free Pizza Crust & Sauce Mix, shall we? 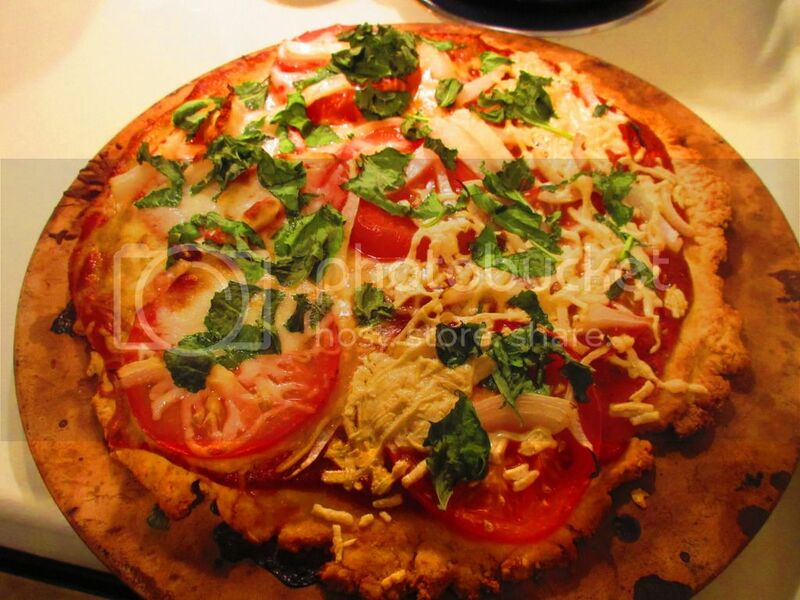 This pizza crust mix is made from rice flour, tapioca flour, sugar, baker’s yeast, potato starch, cassava flour, salt, less than 2% hydrogenated palm kernel oil, soy lecithin, baking powder and, xanthan gum. The sauce mix is made from maltodextrin, dehydrated garlic, garlic powder, salt, dehydrated onion, spices, roasted dehydrated garlic, sugar, Romano cheese, less than 2% of natural flavors, toasted sesame oil, citric acid, whey, cheddar cheese, hydrolyzed soy protein, disodium phosphate, and silicon dioxide (anticaking). As far as the nutritional information for the Tastefully Simple Gluten Free Pizza Crust & Sauce Mix goes, this isn’t bad for pizza. Really. A serving size is 1/6 of the package. This serving will dish up 200 calories, 1.5 grams of fat, no cholesterol, 810 mg sodium (it’s a little high, yes), 43 grams carbohydrates, 3 grams sugar, 1 gram fiber, and 4 grams of protein. If you love pizza and want that “from scratch” appeal with a golden, crispy crunch, without it being the frozen cracker-crusts that the gluten-free community are otherwise delegated to having…then give Tastefully Simple’s Gluten Free Pizza Crust & Sauce Mix a try. Hop on over to my friend, Rebecca Fifield‘s, page and place an order. Not only will you be amazed with how easy this is to make, the taste, texture, and everything else will win you over. I promise you that. This entry was posted in Baked Goods, Cheese, Dough, Entree, Flour, Gluten-Free, Italian, Mix, Mushrooms, Pizza, Products, Review, Sauce, Vegan, Vegetables, Vegetarian by The Celiathlete. Bookmark the permalink.